Why Does Family History Fascinate Us? 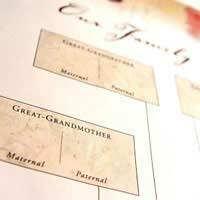 Home > Basics of Genealogy > Why Does Family History Fascinate Us? Family history, looking into where were come from and tracing our family trees, has become incredibly popular. There have been several series of television programmes where celebrities investigate their ancestors, and the usual accompanying books, both of which have found eager audiences. But the bigger question is why there’s been such a surge of interest in the subject. What’s changed to make us all so intrigued with our pasts and the histories of our families? Why do we feel this need to know? For all the talk that people rarely used to leave the villages or towns where they were born, it was never completely true. People have always migrated to find work, although many would stay put, generation after generation. But moving has become a much greater part of modern society. It’s become rare for us to spend even a decade in the same house, and we move around the country – and abroad – far more than ever before. We’re a society on the go, and that means we put down fewer roots. Previously, even when people moved away, they retained a strong connection to their homes, a sense of belonging. They knew where they were from, who their people were, parents, grandparents and back through the generations. We don’t have that any more, and that might well be an explanation for why we need to know where our families originated. It’s human to want to belong, to have a sense of our histories, and tracing a family tree, watching the past unfold, can give us that. For some, there can be the mystery and romance of a family story that needs to be solved. Plenty of families have their tales, often only half-remembered after so long, and tracking down the reality – which researching a family tree can sometimes accomplish – can be a very satisfying achievement. Of course, there’s also the intellectual challenge of it all. Digging down and gradually piecing together the story isn’t easy (although the amount of information now available online has made it all considerably easier). It takes time and effort to build up the larger picture, and the farther you go back, the harder it becomes. Going just as far as you can is like slowly putting together the pieces of a puzzle, and the more information you can find about each generation, the more complete the picture becomes. As much as we want to know where we come from, one of the biggest gifts we can pass on to our children is a sense of the past, of where their real roots lie. It’s passing on a history to them, keeping them aware of family, not just the people immediately around them, but those through a few centuries who’ve ended up shaping the present, even unintentionally. For people interested in history, tracing a family tree is a way to make it come alive, to people it with personalities, and to become a part of that history. It puts us – the current generation – in a context, and reminds us we’re all part of something greater, a continuum. It also reminds us that, whatever we think, we’re not the culmination of all that’s gone before, but just another link in a much larger chain.